"Olive Salad" - how do you like that for a title? Fact: I love olives: raw, in a salad, in a fish dish, pickled, cooked. My favorites though are the black kalamata olives. They are so rich in flavor and juicy with olive oil. They are Mediterranean after all. Well this post isn't about olives or food. 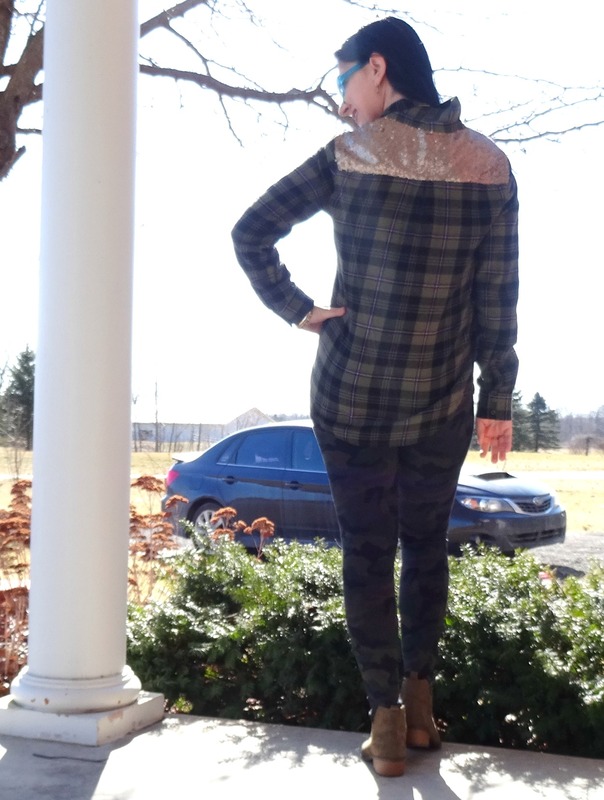 It is about style and it refers to my outfit. 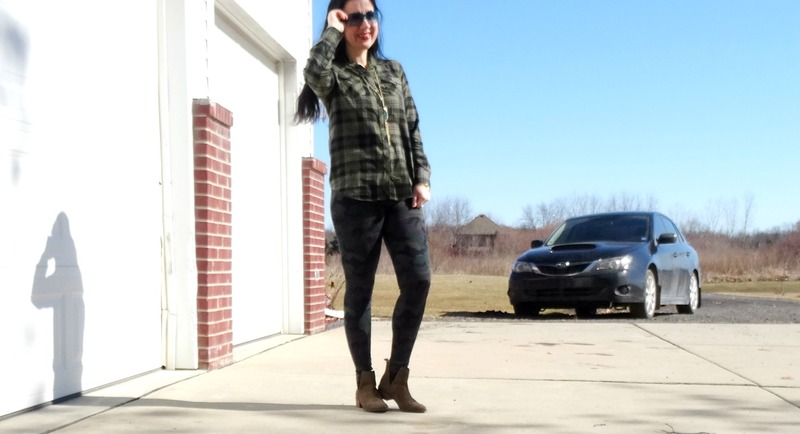 I have on Olive Faux Suede Booties, Olive Camouflage Leggings (new from Payless and they are amazing) and an Olive Flannel Shirt. 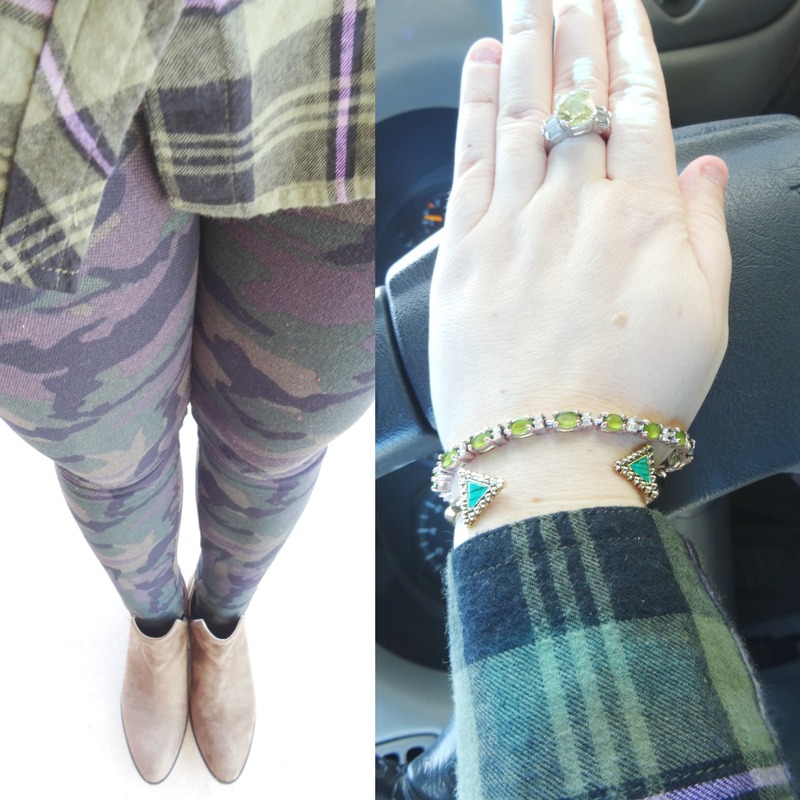 I did a little pattern mixing between the camo bottoms and plaid top but it worked. 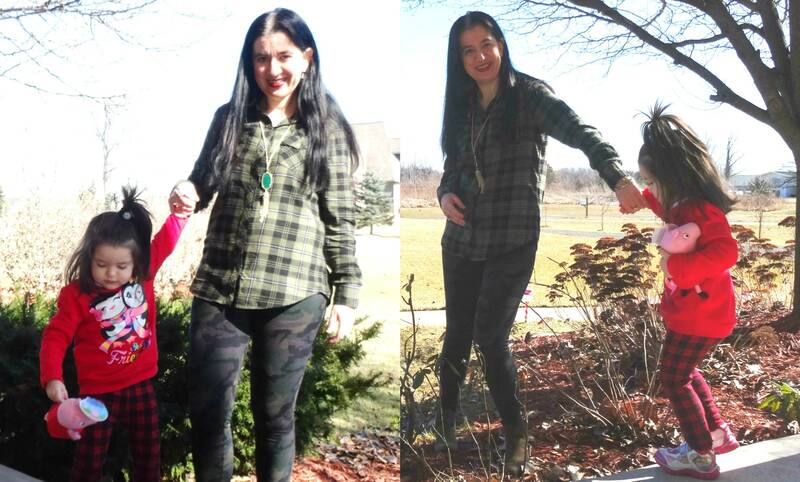 Since both the shirt and the leggings have olive and black as the main colors, mixing the two patterns was super easy. 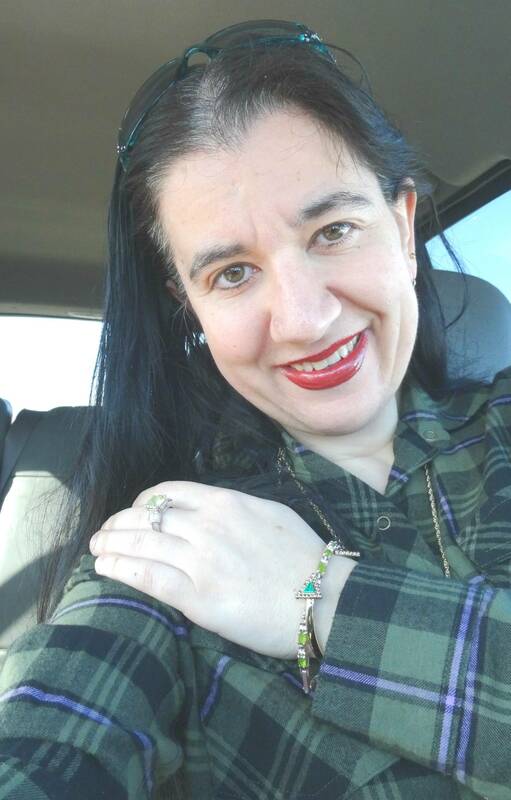 My Bright Green+Gold Jewelry courtesy of Rocksbox worked perfectly. 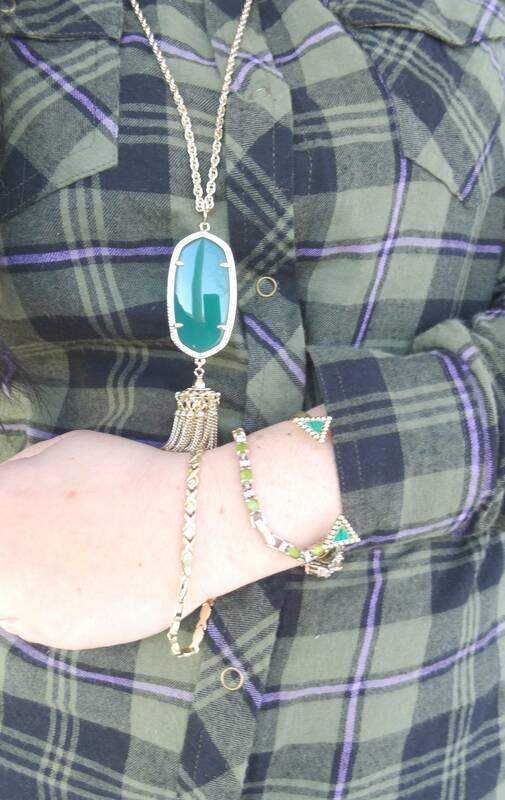 I ended up buying this Rayne necklace in green. ...However, these outfits were worn about 4 weeks ago on a Saturday. 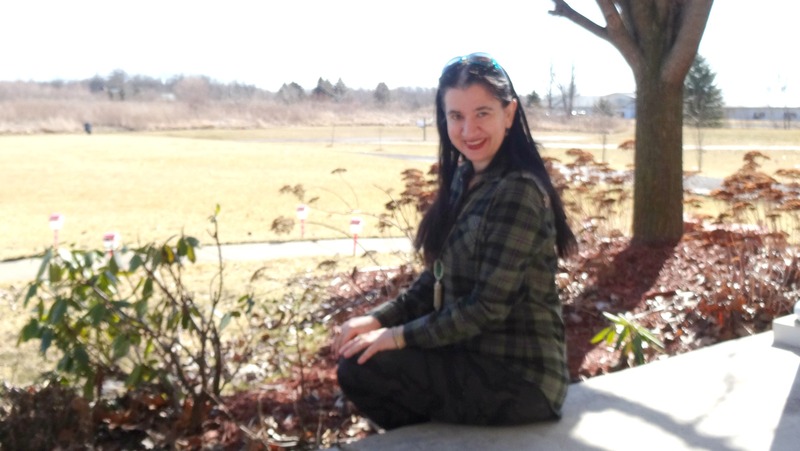 As you can tell from all that glaring sun, it was sunny and warm. 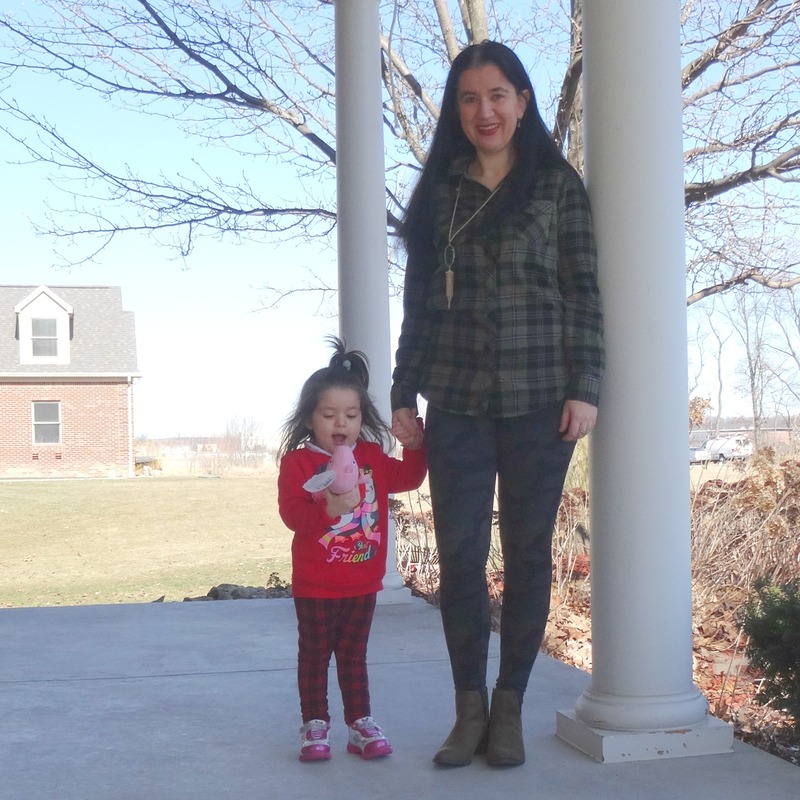 It truly was the first day when it felt like Spring, true Spring. 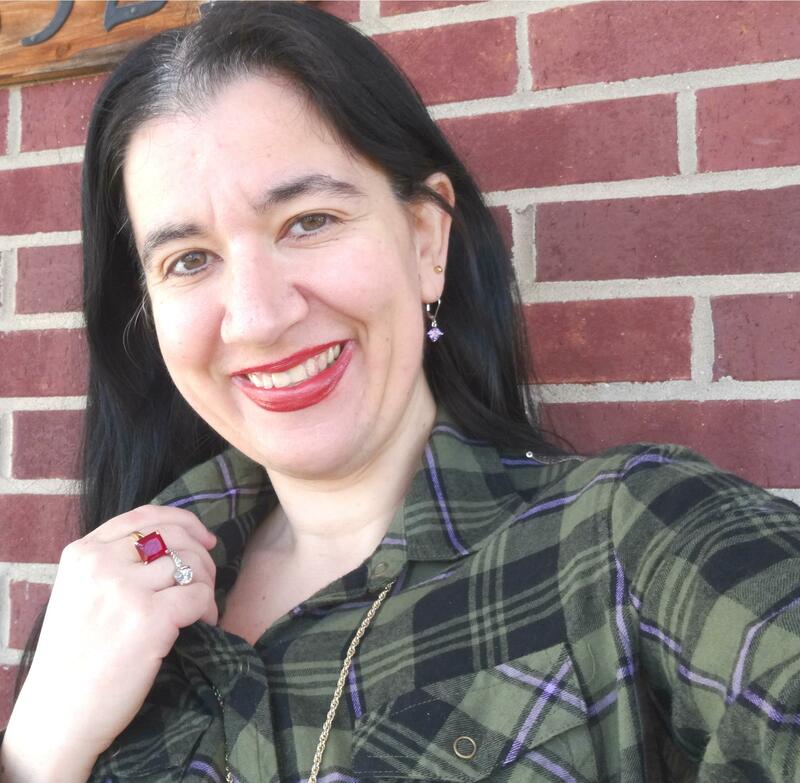 This post is perfect for this week for two reasons: sporting some Green for St. Patrick's Day (2 days away) and since our time changed and we all did a Spring forward (2 days ago). 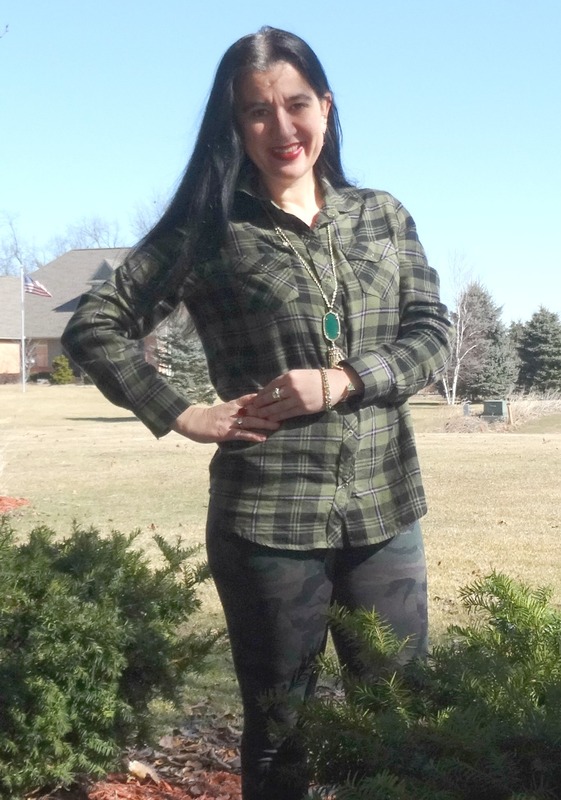 Wearing booties, leggings and a plaid button-down shirt (even-though it is a warm flannel type) over only a tank top is still dressing light and breezy for a Mid-February Midwest Winter day. This is February in Michigan after all. 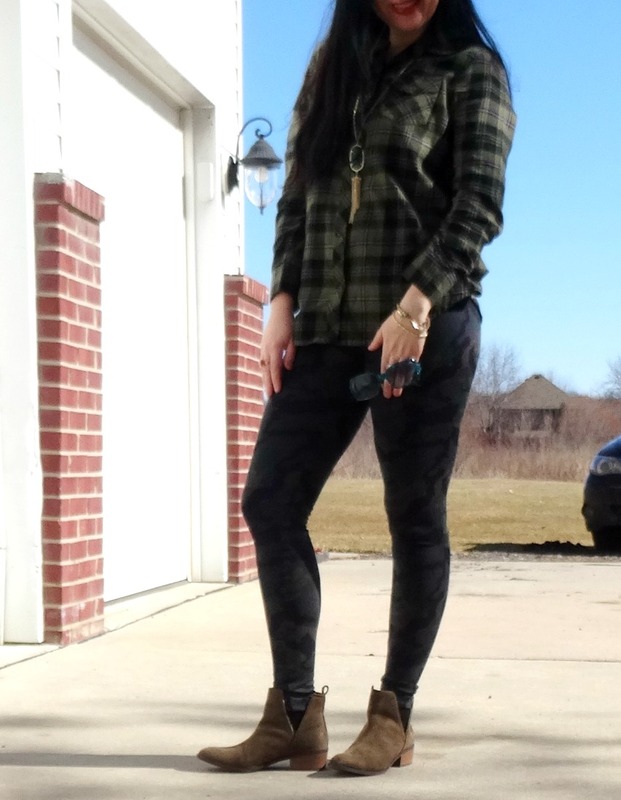 I wore this Outfit to run quick errands and go to Walmart (sans Vivian) that morning. 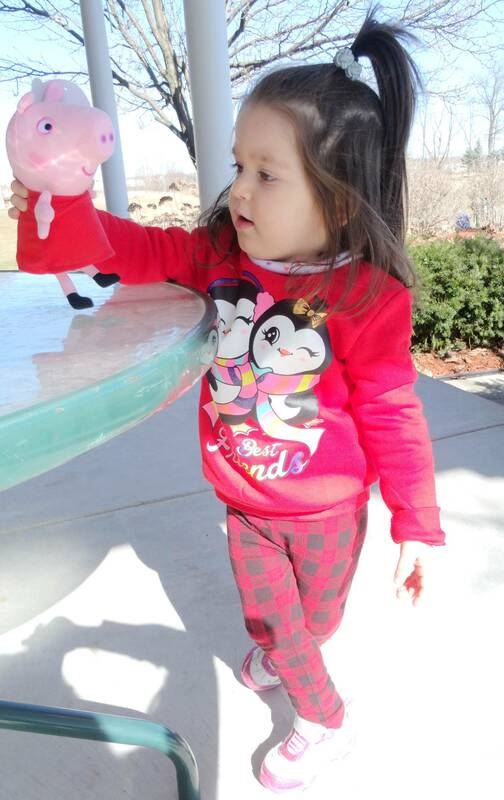 Vivian has a lot of Peppa Pig toys and clothes already since Peppa is her favorite cartoon character but while at Wal Mart I spotted this little Peppa stuffed animal and for 5 bucks I bought it. 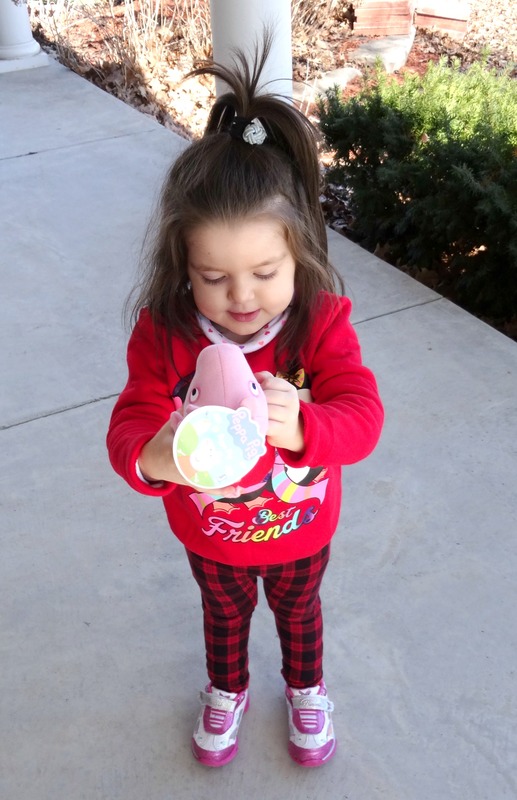 A few days later I went back to get Suzy Sheep (Peppa's best friend) also in a small stuffed animal form. 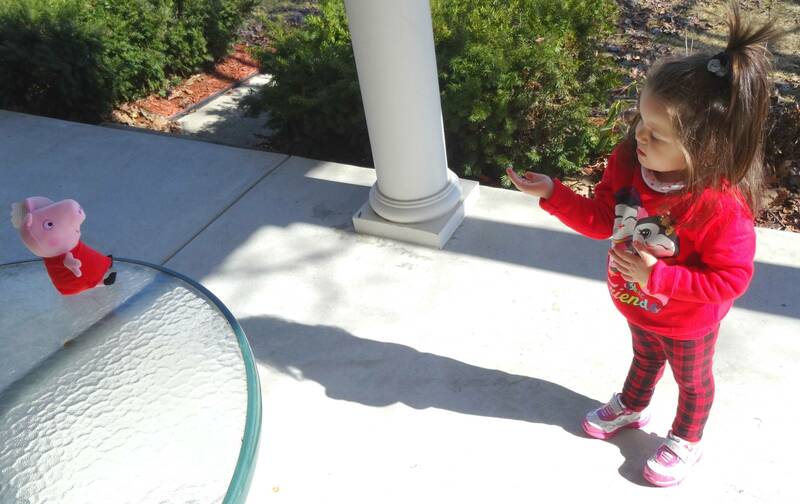 Vivian knows ALL the characters from the "Peppa Pig" Show. 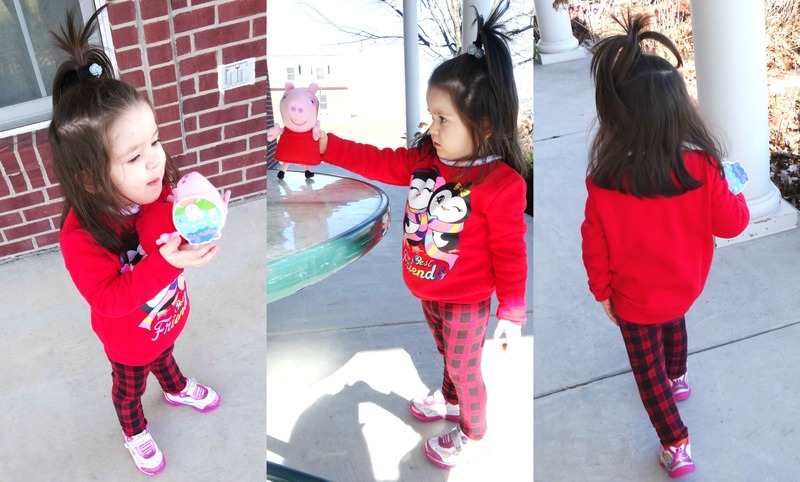 Vivi was very excited and she wanted to show off her new Peppa stuffed toy in all these pics. 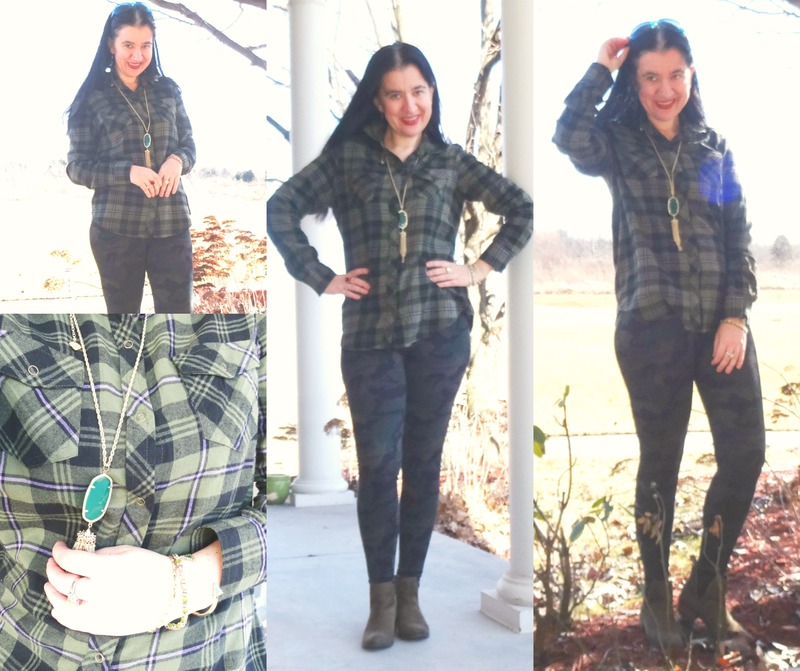 So, how did we style our Plaids and how do you like the olive salad I have going in this outfit? 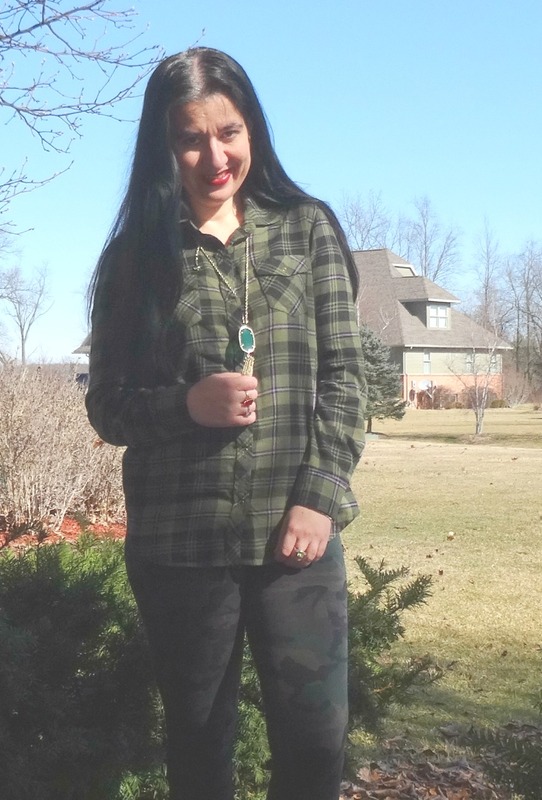 Olive Green+Black Plaid, Long-Sleeve Flannel Button-Down Shirt w/ Sequin detail on the back: JC Penney (New) (similar, Splurge), (similar, Great Deal, love this), (similar, Steal). 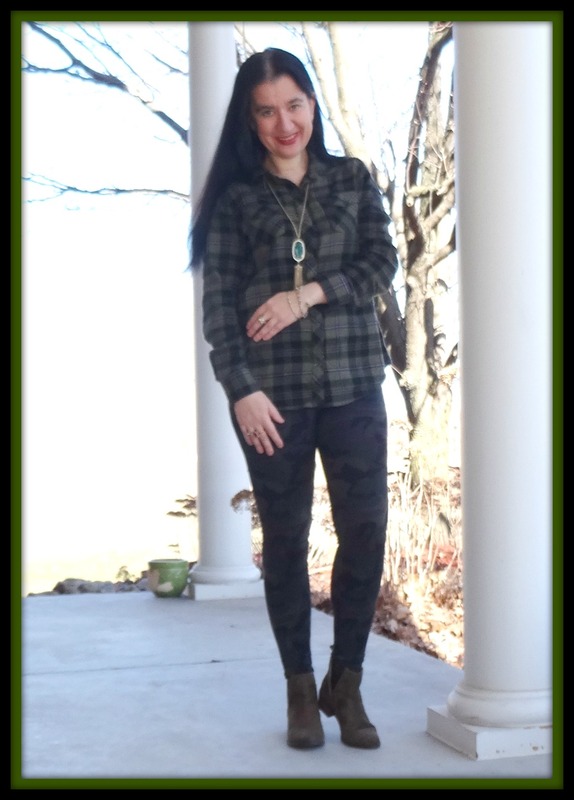 Olive+Black Camouflage Leggings: Payless (New) (similar, Splurge), (fun option, Great Deal, love these), (similar, Steal). 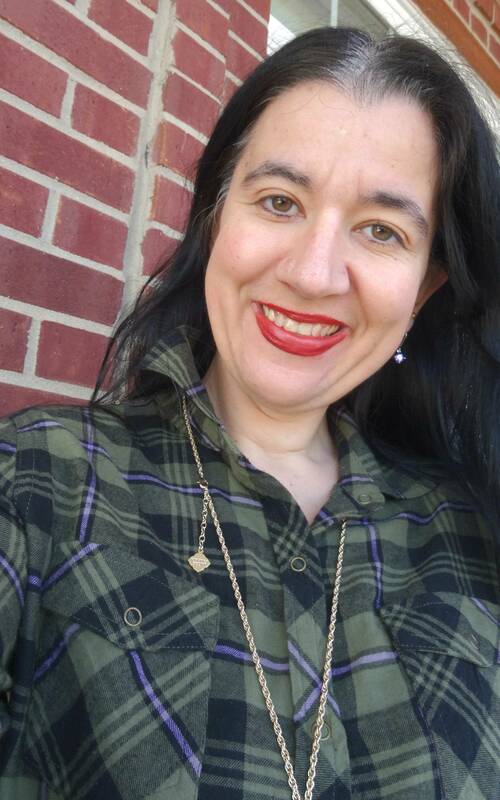 Teal Plastic Sunglasses w/ Colorful mini Rhinestones off the side: Von Maur (Gifted) (similar, Splurge), (similar, Great Deal, love these), (similar, Steal). 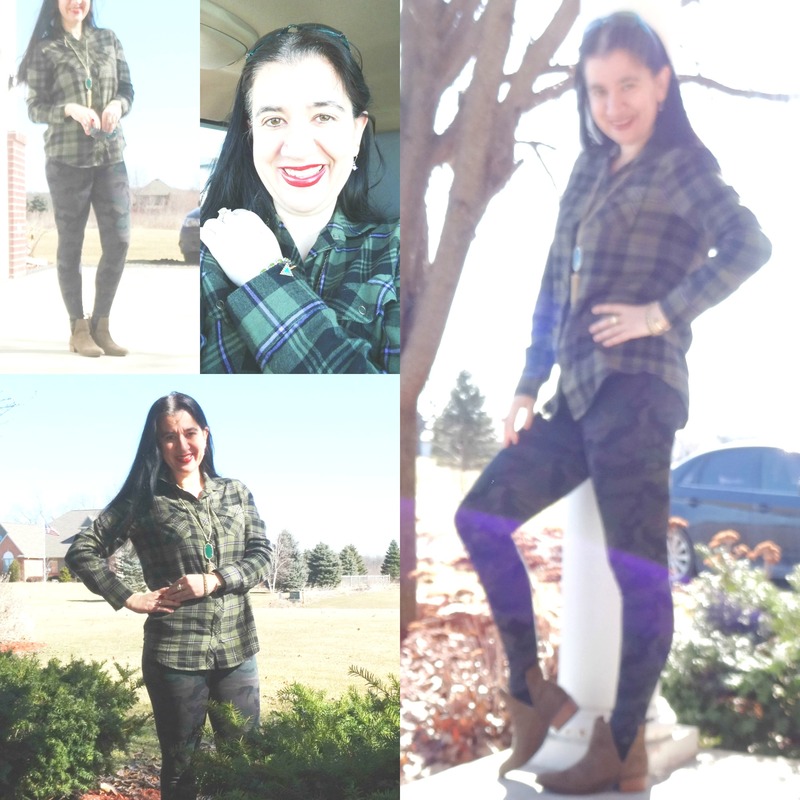 Olive, Faux Suede, Open-side Booties: Charlotte Russe (New) (similar, Small Splurge, love these), (similar, Great Deal), (similar, Steal). 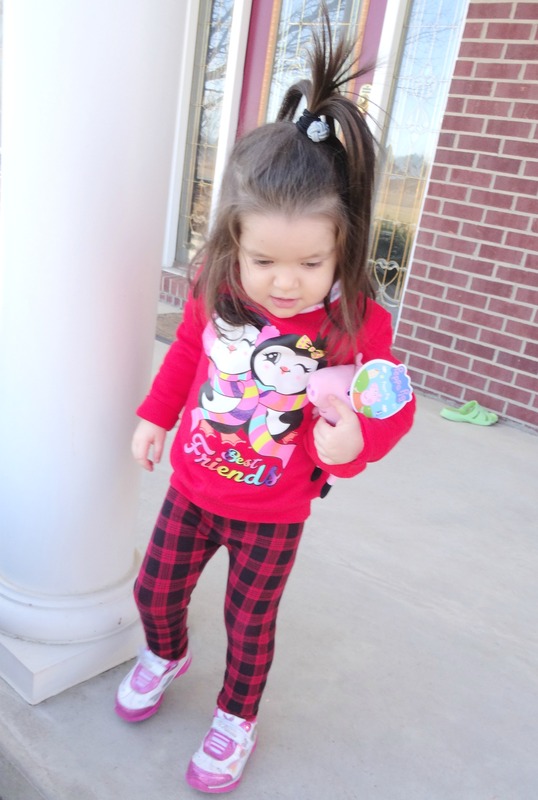 Red+Black Plaid Leggings: Old Navy (New). 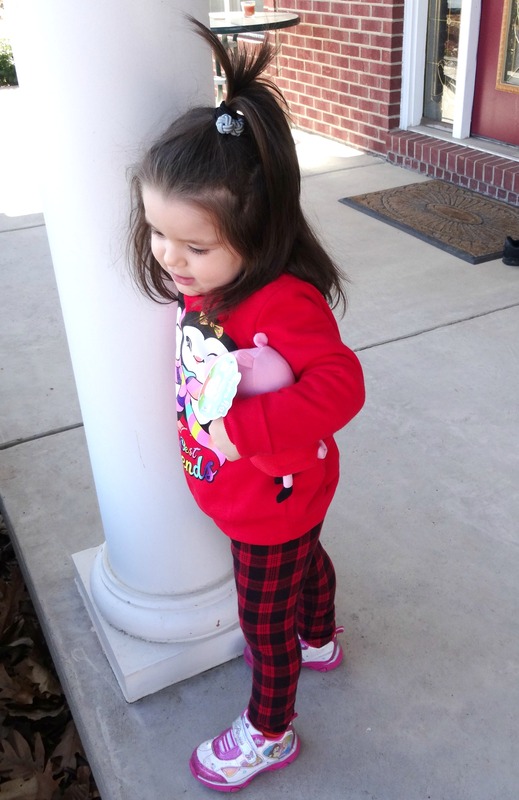 Charcoal Grey LeggingsPeppa Pig Stuffed Animal: Wal Mart (New). 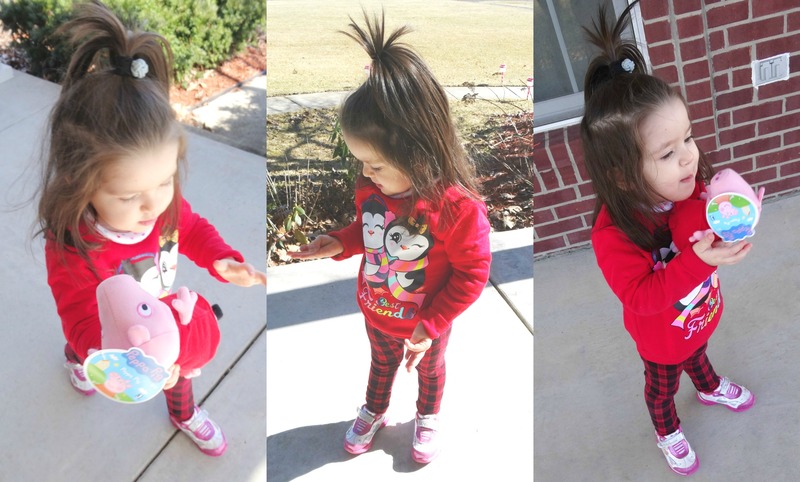 Black Elastic Ponytail Holder w/ 2 Woven Baby Blue Balls: J. Crew. 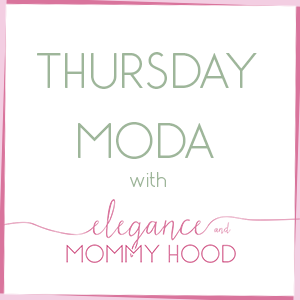 Stay tuned for more Saint Patrick's Green next and the third week of the "Thursday Moda" linkup. 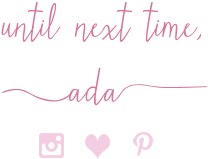 Thank you for reading and Happy Hump Day! Lauren, Leeanne, Linda, Lindsey, Lisa, Liz, Monica, Nicole, Rebecca, Sarah, Sharon, Mix+Match Fashion, Vicki, and Victoria.